Pick a nickname and a server to play in. Once you go in-game, you’re plunked in the middle of a zombiepocalypse with nothing but your wits and a trusty pickaxe. Explore a bit and you’ll start discovering resources such as stone, wood and gold, which can be used to establish your base of operations. Once you have a base, the zombies will start coming. Thankfully, you can exchange resources for towers that will help defend your castle. Like all tower defense titles, you’ll get a selection of tower options, each with their own strengths and abilities. Kill zombies to accumulate XP and for leveling your character and base. There’s more. You can visit the shop for better armor, new tools and other items that can stave off the zombie horde. You can form alliances with online players to become a stronger force. Zombs.io is surprisingly deep and it’s great for both short bursts and hour-long marathons. Zombs.io has a steep learning curve but it rewards players well when they get the basics down pat. 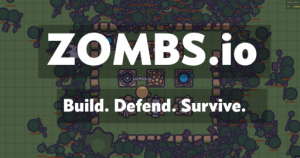 If you don’t want to go through a trial-and-error process, you can jump right in and read everything you need to know at the Zombs.io Wiki page. Some of the more useful resources in the page include information on Resources, Buildings, Tools, Pets and Enemies. Players are granted invincibility for a short period of time, so take full advantage of that by quickly exploring your surroundings. Your first task is to find a suitable area where you can build your base. Keep in mind that zombies won’t attack until you have a Gold Stash, so go ahead and stock up on stones and wood to your heart’s desire. A good strategic location will have access to resources and is far away from monster spots. Your Gold Stash is unique and you can only have one, so make sure it’s protected once you plunk it down. Use doors instead of traps or walls for maximum effect. Moreover, gold is used to upgrade towers and buildings and make them stronger, so it’s in your best interest to create as many gold mines as you can. Read each tower description carefully before placing them around your base. Tower placement is especially important to maximize their strengths. Some do high damage but have limited range while others can continue attacking at a distance but are weaker damage-wise. Have a low-spec computer and lag is killing you? There’s an option to disable GPU Acceleration, which can be found just right below the green “Play” button. This can speed up game-play and provide a smoother Zombs.io experience.